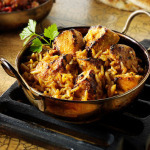 Chicken Tikka Biryani – is a combination of two Indian iconic dish. Prepared chicken tikka masala layered with half cooked basmati rice which is flavored with Indian aromatic spices. 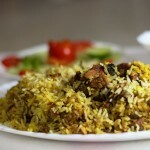 The biryani was first introduced by Nizams of Hyderabad during Mughal regime. Since then the dish is all time super hit . That’s why many different vegetarian ( paneer, vegetable, mushroom) and non-vegetarian (using chicken, lamb, beef, egg, prawn, fish) variations came out later in India. 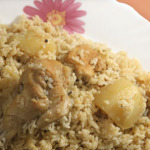 Chicken Tikka Biryani is also an extremely delicious variation. 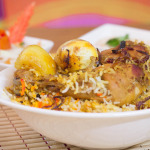 Very spicy and mouth watering tandoori style biriyani can be a special treat for your beloved one. To make the process easy, I divide whole method into 4 parts. The preparation is bit lengthy. I know it’s frustrating. So plan ahead and then follow my easy step by step method like I have instructed below. 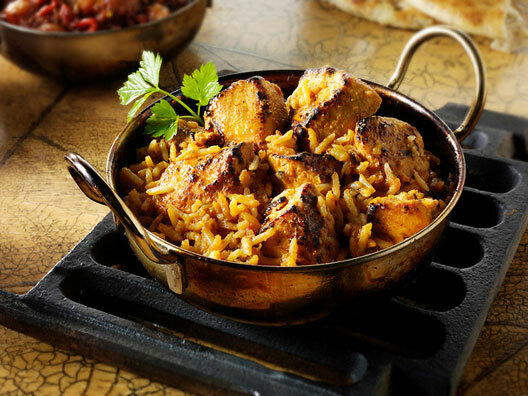 You will definitely get World’s Best “Chicken Tikka Biryani” to relish on. Make 2-3 deep slits on each piece of chicken. The slitting ensures that the flavor from the marinade goes all the way into the chicken, and also helps with quick and even cooking. Marinade the chicken with above ingredients. Keep it aside for 1 hour. Pre-heat oven at 200 C. Thread the chicken in the skewers. Place the skewers on an oiled oven grill & keep an oven tray underneath to catch any drippings. Grill the chicken pieces on both sides, for about 10 min per side until golden brown. Chicken tikka is ready. 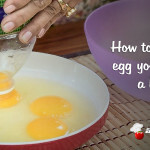 Tips: You can also do it on gas oven. Cook the chicken pieces over low flame until done ( it can take 15-20 minutes). To give BBQ flavor – put all the chicken pieces in a deep dish, light a piece of coal and placeit on a small steel bowl in the center of the dish, then add a few drops of ghee/ clarified butter to the lit coal and cover the dish so that the smoke is retained inside and gets absorbed by the chicken. Open the dish in 2 minutes and discard the coal. Fry the onions till golden brown. Keep aside. Heat the oil in a deep pan and then temper the oil with whole spices (cinnamon, cardamom and cloves) followed by the fresh chopped tomatoes and half of the green chili. Cook until the tomatoes are dry, then add half of the fried onions (reserve a handful for later). Add the garlic and ginger paste. Add salt, cumin, chili, turmeric and coriander powders. Cook together until the oil is released from the sides. Now the whipped yogurt and the reserved marinade as well as the drippings from the chicken and cook until the gravy is thick and cooked through. Sprinkle the sugar and mix well. Add about 1/2 cup water to immerse the chicken pieces in. Once the water simmers, reduce the heat to low and then gently add the grilled chicken. Cover and simmer on low heat to cook the chicken through. Every once in a while, open the pan and stir gently with a flat spoon so that the gravy coats the chicken and they get turned over so that they may cook evenly on all sides. This should take about 10-15 minutes. Once the chicken pieces are fully cooked adjust salt. Add garam masala and chopped coriander. Wash and then soak 3 cups of rice (450-500 gm) in water for about 20-30 mins. Then drained and keep aside. Bring a big pan of water to boil. Add salt, 1 tbsp and put a bundle of 4 cardamom pods, 2-3 cinnamon sticks and 2-3 cloves. Put the rice to this boiling water. Cook until the rice is about 1/2 done, remove and strain out all the water. In a sauce pan, make a layer of rice, prepared chicken gravy and fried onion. 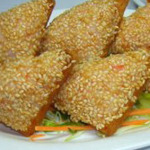 drizzle 1-2 tbsp saffron water and add coriander leaves on the top. Cover the lid tightly and simmer for 15-20 minutes. 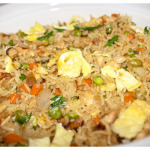 This tends to infuse the lovely biryani flavor into the rice as it steams. Chicken tikka biryani was just the best. I used boneless chicken thighs, delicious, can’t wait to make it again.